We provide award-winning security services which cut your security costs and address issues confronting the guard industry. 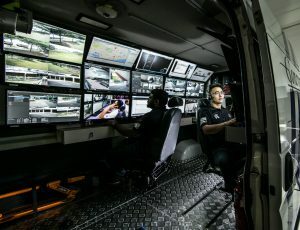 Officially launched in late 2015, the patented I-Man Facility Sprinter (or “IFS”) is essentially a mobile command and control centre equipped with advanced monitoring and wireless communication equipment managed by a team of 3 Intelligent-Man (I-Man). Wirelessly connected to a cluster of buildings, the IFS provides security surveillance to these buildings and responds immediately to any security incidents. IFS provides a more secured and robust solution for our customers despite the reduction in manpower. It utilizes smart devices, like intelligent cameras with video analytic capability and multiple wireless communication technologies using TV White Space (TVWS) as the core technology. The video analytics allow our I-Man to respond to alerts instead of constantly look out for abnormal activities from the multiple monitors installed in the IFS. As the IFS is wirelessly connected to multiple buildings in the vicinity, this forms a cluster enabling the reduction of man guards especially at night. The cost saving allows Concorde to price its services to about half of the cost of a traditional guard. Productivity is greatly improved as the 3-man team provides services to 10 or more buildings. Securing premises with intelligent cameras and access controls enhances security while minimizing the deployment of human on the ground, normally the weakest link of any security solution. Accordingly, since IFS is integrated to multiple buildings, it becomes a logical platform for introduction of smart solutions and other advanced technologies. Aligning with Smart Nation initiatives, Concorde uses big data analytics to do performance monitoring and improve facility maintenance, all of which are value-added services to building owners. Deployment of any IFS to a particular cluster can be done seamlessly as each IFS is already pre-integrated to all the clusters in an area. These would minimize downtime and provide redundancy. Compared to traditional guards and central monitoring solution, IFS is a simply a revolutionary more intelligent and efficient way of providing security. It emphasizes the use of technologies, allowing people to be elevated to a higher and more intelligent role, in line with the Smart Nation vision. A video explaining how our IFS works. The connectivity of many buildings to IFS vehicles provides a new platform for more advanced technologies and solutions to be introduced and implemented for the benefit of building owners and society. This will be the key to a sustainable and successful business model. Stay updated with our latest solutions. © 2019 Concorde Security Pte Ltd | All rights reserved.